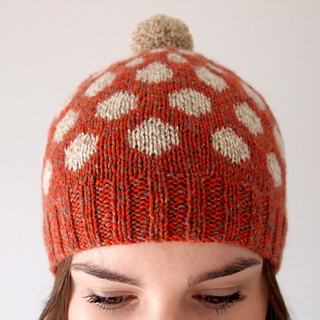 MUSCARIA is a fun colourwork hat knit in two shades of DK yarn. 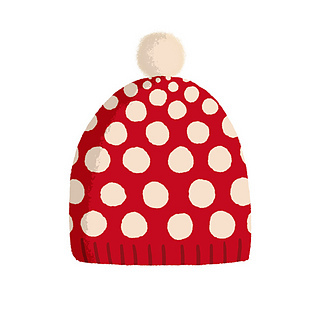 It features a polkadot design with smart crown decreases and a pompom on top, and it resembles the appearance of the Amanita Muscaria mushroom, also known as Toadstool. The pattern is easy to knit and memorize, creating a striking, warm fabric, and it’s suitable for colourwork beginners. 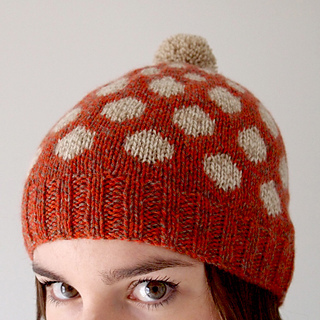 MUSCARIA comes in in a beanie shape that will fit most adult heads. 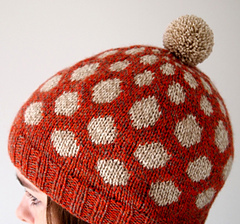 You can easily knit this hat with yarn you already have in stash, and get creative with multiple colour combinations. Beanie to fit an average adult head, 50-55cm/20-21.75”. The length of the hat is 20cm/8“. Two shades of DK weight yarn, about 40grs/120yds of MC and 20 grs/60yds of CC (15 grs/45yds extra if making a pompom). The samples were knit in ColourMart Extra Fine Merino DK yarn, which gives 460yds every 150 grs. You can substitute it for any yarn that gives a similar yardage of 150yds/50grs. 26 stitches x 30 rows 10cm/4” in colourwork with larger needles, lightly blocked.